2RU uninterruptible power supply - battery backup / power conditioner. AVR, RS-232 & USB interface; no fan. The Furman F1000-UPS: battery backup is designed exclusively for audio/video professionals and home theater aficionados. For decades, traditional audio/video components were simple analog devices designed to easily weather power outages of well over two seconds. Later, as computer and microprocessor based components gained in popularity, their extraordinary sensitivity to even a fraction of a second’s power loss was managed with traditional UPS (uninterruptible power supply) technology. Unfortunately, these units were solely designed for the I.T. professional. Though they included many technologies and features appropriate to that application, they fell short for premium audio/video components. Though many of these manufacturers later recognized the ever emerging professional audio/video, broadcast, and home theater market, their lack of experience led merely to a re-tooled chassis. These hastily produced UPS devices lacked the technologies necessary to truly optimize protection, performance, and control for today’s audio video components. The Furman F1000-UPS more than fills this void, and offers your system unparalleled battery back-up technology, created from the ground up to meet the exacting demands of the world’s most sensitive audio, video and control systems! Audio/video systems can vary greatly in their size and components, and as such, flexibility is needed in determining how a battery backup solution should function under different circumstances. Because of this, Furman has provided open source RS-232 control over two independent AC outlet banks, with a wide range of control features to interface with an existing automation solution. Dual programmable IR control allows the unit to send a shut down command to remote components no more expensive projector bulbs to replace in the event of a blackout. • Standard Voltage Regulation delivers a stable 120 volts of AC power to protect equipment from problems caused by AC line voltage irregularities. 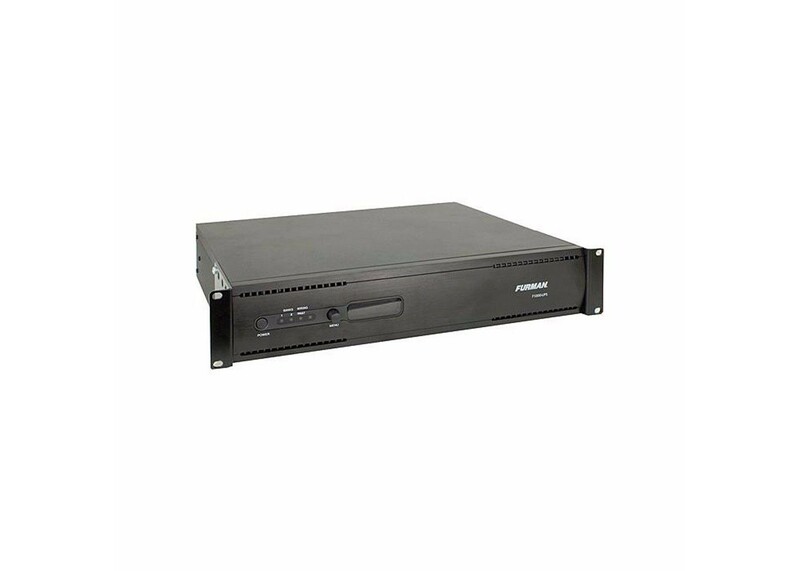 • 1000VA Simulated Sine Wave battery backup protects your data in a power failure allowing the opportunity to save your applications, programs, and shut-down the system gracefully. • Learning IR control allows you to program connected equipment for shut-down sequencing. • RS-232 Open Source Code Protocol provides custom programming for connected equipment. • 12 Amp rating featuring a circuit breaker for added protection. • 8 rear panel outlets. • Critical Load Management prioritizes the allocation of temporary power to connected equipment. • Easy to use power control software assists you in maximizing the performance of your UPS.